There is something to that old grandmother's saying which goes 'whatever happens, happens for the best'. I woke up on Wednesday morning and remembered that it was a shoot day. We were planning to shoot a YouTube video at Colaba for The Finely Chopped. The problem was that though my producer, Ruchika, had gone there the previous evening, she was unable to meet the owner of the place where we had planned to shoot and everything was in a state of limbo. Once I got out of bed I realised that I had a very bad back and going to Colaba seemed out of the question. Plus our shooting plans were not in place. So I headed to Candies for a cup of coffee and some fried eggs. I walked past the Christmas tree there and went in and ordered my double shot cappuccino. I took a sip and then inspiration struck me. Recently Surjopriya from Bong Bong had sent me a Christmas cake from Nahoum's, the legendary old Jewish owned cake shop in Kolkata's New Market. I opened the fridge in morning, before I went Candies, and saw that my cousin, who is visiting us from Kolkata, had finished the cake. His preferred diet of mutton, rice, chips and cake reminds me of what it is like to be skinny and in one's early 20s again. I rang up Ruchika of Ping and said "hey I can't go to Colaba because of my back. So come with the crew to Bandra instead please. 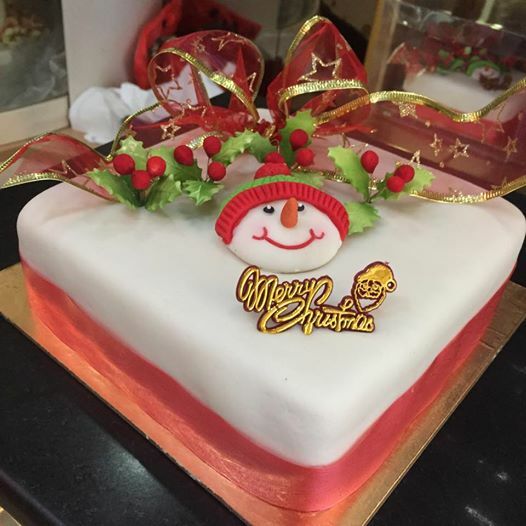 Let's do a Christmas cake hunt in Bandra shoot'. 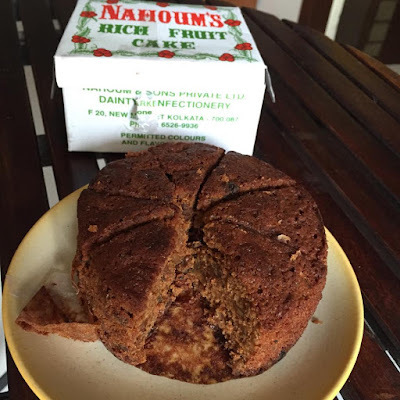 This was an idea sparked off by Tanima's query, on the Finely Chopped Facebook page (please like the page), when I had posted the Nahoum's pic about where to buy Christmas cakes in Bandra. So the crew headed to Bandra instead of Colaba while I quickly went back home for a shower and a shave and returned just as Ruchika and the crew came into Candies. 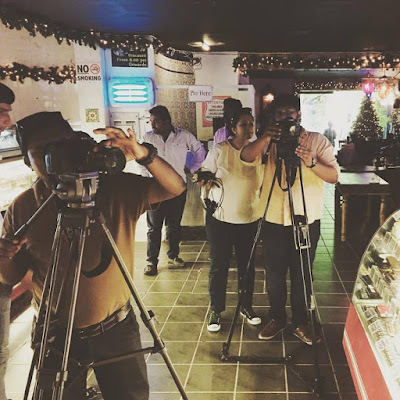 We started our shoot at Candies@ McRonnels at Pali Naka, which competes with the Damian Christmas display to be the best place to soak in the spirit of Christmas in Bandra. They make plum cakes for Christmas in Candies. It's the cheapest of the cakes that we checked out on Wednesday morning. Doesn't have alcohol in it. To make it kid friendly I am told. Made sense, surrounded as I was by jumpy tiny tots in their school uniforms. The petite fours at Candies have a festive air too with Christmas motifs on the sugar cake icings and the angry birds and minion sugar figurines have Santa caps on. We then headed to the American Express Bakery at Hill Road. A few Chritmasses back, I had gone with my colleagues at the office I worked in then to American Express at Byculla. We had the Christmas pudding there which I liked so much that I bought some for home that year. Turned out that my friends Sue and Nathan, who were in town, liked the Christmas pudding at AEB too so I requested them to join me on camera. Nathan told me that Sue does all the talking in the family which is why we miked her up. She is now looking forward to her Bollywood debut after this video. 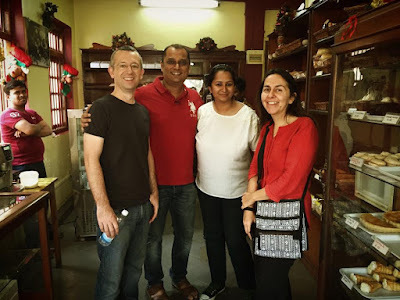 Apart from the Christmas pudding at American Express Bakery, which is pretty boozy with rum and Cointreau, they also have local Goan Christmas favourites such as marzipan and Guava cheese. Sue told me that they hardly see marzipan in the UK now and that she had seen something similar to Guava cheese in St Lucia in the Caribbean. Sue said that they come to India for Christmas as it it is cold in England and Christmas gets boring there as stores start celebrating Christmas since October which makes it a bit of an anti-climax by the time Christmas comes. I bumped into ad man Agnello Dias, of Taproots, at the American Express Bakery. I've been to his house for sorpotel on a couple of Christmases. He is a big American Express Bakery fan. He told me about how the bank tried to sue the bakery for the name when the former entered India. 'The bakery guys won as they proved they have been in India longer' said Aggie with a grin. My last stop was Rejoyce at Lilavati near the Starbucks there. I first heard about Rejoyce from Bandra boy, Anil Kably, who owns the Bagel Shop. He gave me some wonderful Christmas cakes one Christmas. He told me that he had bought them from Rejoyce and stocked it in his cafe. I loved those cakes. Turns out that Rejoyce is named after its owner, Mrs Joyce Fernandes. She learnt baking in London 30 years back, came back to Bandra and baked cakes from home. She opened her shop 10 years back. There were some grand wedding cakes on display. The fruits in the cakes in Rejoyce are soaked in rum 6 months before Christmas. At the moment you have to buy a full cake. There is a 2.5 kilo one with icing and a 1.5 kg one without. The cakes here are the biggest and the most expensive of the 3 places I went to but are special. They will have smaller and cheaper versions at the store from the 20th of December. So here's wishing you a very merry Christmas in advance, hope some good cake comes your way and please subscribe to my channel and make my Christmas more merry!